The nearby community of East Rochester was once home to Merchants Despatch Transport, builder and operator of leased refrigerated freight cars. The long history of this town’s development stretches back to 1897, when MDT began construction of a new car construction shop in some grassy fields outside of Penfield. The first railcar to emerge from this complex rolled in 1898, thus beginning 72 years of manufacturing in East Rochester. By 1899, more than 700 workers were employed in the growing facility, which was used by MDT to manufacture and maintain its line of leased freight cars. The Despatch Shops eventually became a subsidiary of the New York Central, and manufactured thousands of freight cars. The factory was shut down by successor Penn Central in 1970, however, the MDT name would survive until the present day as a transportation lessor. 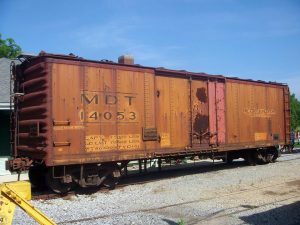 MDT 14053 was built by Pacific Car & Foundry in Renton, Wash., in 1958, as part of a lot of 150 cars for Northern Refrigerator Car. Built as NRC 20065, it became MDT 14053 after Northern Refrigerator was merged into MDT in March 1962. Measuring 45 feet, the ice-cooled car uses with Equipco Model 54-6 electric air circulating fans powered by an axle generator. This particular car has has a combination of a 4’ sliding door and a 2′ plug door on both sides. In later years, this car was used as an MDT support car at Enola, Pa. The car was amazingly well kept, inside and out, and retained its mid-1960s appearance. No longer needing the storage, MDT donated the car to the museum, and it was delivered to Industry on October 18, 1993. The reefer traveled on its own wheels, using an all-Conrail routing. 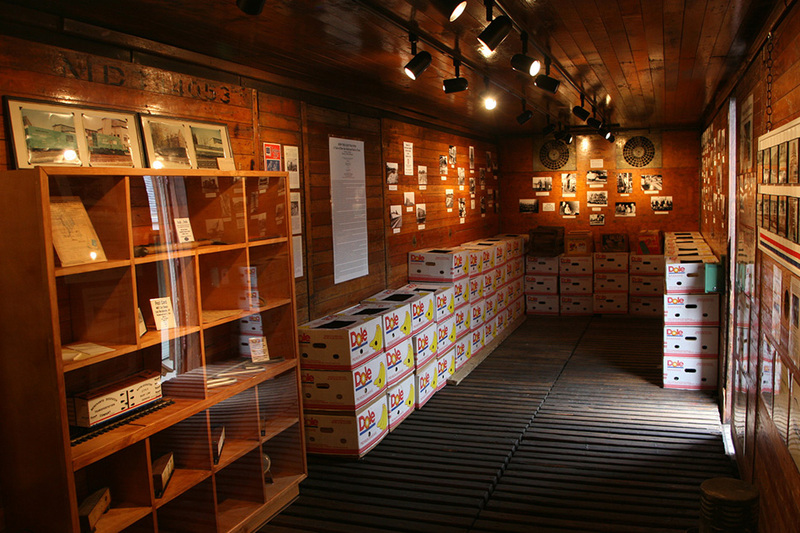 The ice-cooled reefer is currently on display in the yard at Industry, and houses an popular exhibit about the history of East Rochester and the people who worked at Despatch Shops. Built 1958 by Pacific Car & Foundry, Renton, Wash. This exhibit housed in Merchants Despatch Transportation #14053 shows the history of the MDT and the Despatch Car Shops in pictures and more!